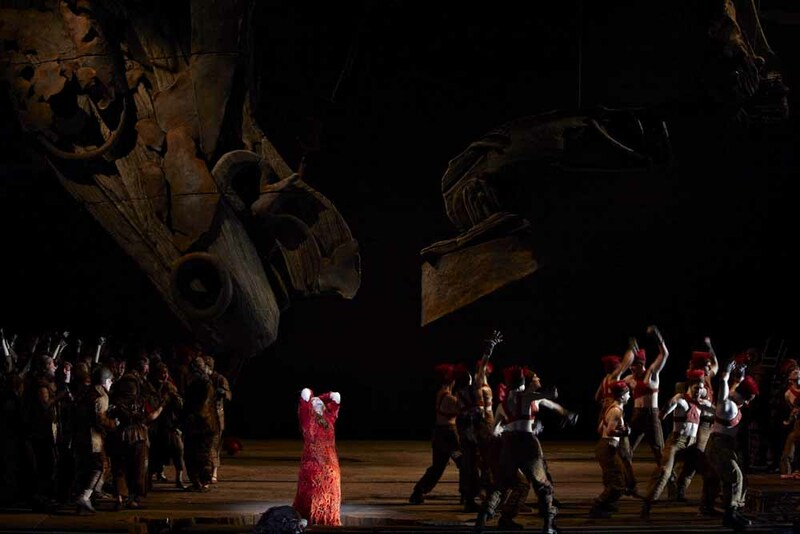 Any performance of Les Troyens is automatically a Big Event. Its length, its awesomeness, and its strangeness are all on a grand scale. The Deutsche Oper Berlin’s new production is successful in a number of ways, and allow you to appreciate how wonderful a piece this really is. But it’s not an unqualified success, and while it boasts good conducting by Donald Runnicles, a good orchestra, a great chorus, and a super Troy staging with a fantastic Horse, some so-so principals and a wayward Carthage made it only partly unforgettable. Berlioz, Les Troyens. 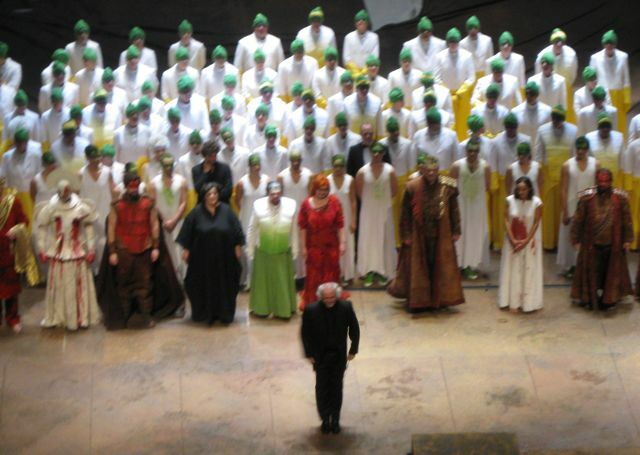 Deutsche Oper Berlin, 12/5/2010. New production premiere, directed by David Pountney with sets by Johan Engels, costumes by Marie-Jeanne Lecca, lights by Davy Cunningham, choreography by Renato Zanella. Conducted by Donald Runnicles with Béatrice Uria-Mozon (Didon), Petra Lang (Cassandre), Ian Storey (Énée), Liane Keegan (Anna), Markus Brück (Chorèbe), many more, see the full cast list here. 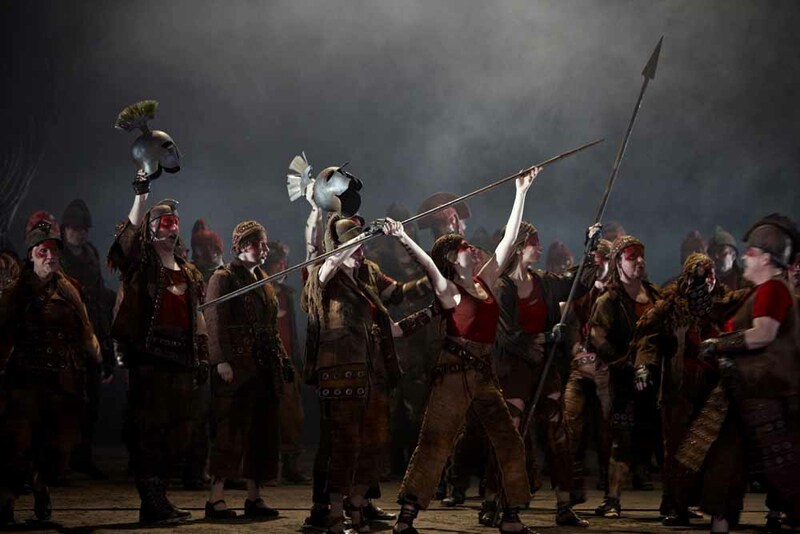 David Pountney’s production is about the conflict between man (Troy) and woman (Carthage). This begins well. His Troy is set in dirty brown, rusty red, and gold, a large empty stage filled with teeming crowds. The costumes are those of timeless grungy warriors with much brown leather, grommets, and random incidents of facepaint. The Trojan Horse is a wonderful effect, seen only in terrifyingly enormous, living parts: kicking feet from above, a giant nose. It’s good design, these people look like they’ve been besieged for ten years, and the tired, fragile, gilded grandeur of Priam (in a wheelchair) is just right. Cassandre hovers around a red, glowing crack in the brown stage, opposite Hector’s grave, and frantically knits. She is making something that looks like the head of a horse. I can appreciate this on a mythological level–Cassandra’s story is rather similar to Philomela’s–but this craft project looks like something that shows up every year at the church rummage sale (and made me think of The Godfather). 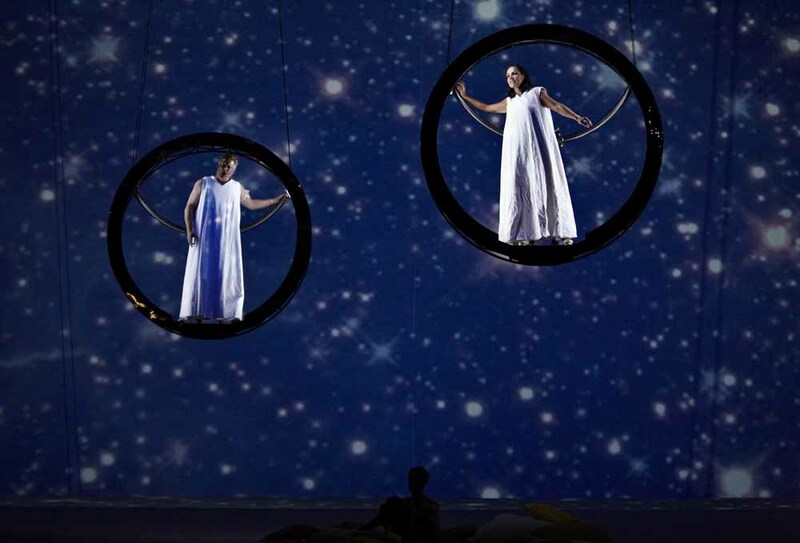 In Act 2, we see a a large metal circle, ringed with bare bedframes with a vortex in the middle. The ghost of Hector rises out of this center hole, and it is where Cassandre kills herself, along with an army of white-veiled women (their veils a foreshadowing of the women’s world of Carthage, a world they can’t create in Troy). The symbolism of the empty beds eludes me, but, like many other tableaux in this act, it’s a striking image. The Personenregie is simple but good, particularly that of the chorus. They move as a convincing crowd, in Troy alternately a steadily advancing, organized mass and a frantic flowing mob. Chorèbe and Cassandre’s scene is touching. Unfortunately, things go downhill once we get to Carthage in the second part of the opera. While Pountney’s Troy was ruled by supposedly masculine might and ferocity, Carthage is a sensual woman’s utopia, decorated in white, yellow, and green and featuring curved lines instead of angles, pillows and lounging instead of armor, and many filmy curtains. The costumes go from warrior to cult, complete with turbans. As a concept it makes sense, but everything stays too static, and particularly Didon is not given a chance to make any journey as a character. Les Troyens has a lot of static scenes to start with, and this kind of oppositional staging, without close attention to the characters, only makes things more flat. The calls of “ITALIE! ITALIE!” feel like no more than a bothersome interruption. And Didon also never shows much in the way of grandeur or power, only the serenity of a guru. (If you’ll forgive me a Lord of the Rings metaphor, Troy in this production is Rohan while Didon is Galadriel.) At the end of the opera, Cassandre guides Didon to her suicide in the middle of the bedframes again, but other than killing themselves in the middle of the same set piece, it’s not clear what they have in common. The score was performed without any large cuts. But while it’s wonderful to hear all the great dance music, the choreography by Renato Zanella is weak, sometimes unintentionally comic (the matelots doing the wave, for example), and generally uninteresting as dance, resembling some sort of aerobics. Narratively speaking, I think Pountney and Zanella really erred with the staging of the Chasse royale. Instead of narrating the awakening love of Didon and Enée, we get a generic ballet of seduction that does not directly relate to the plot, and then we see Didon and Énée in full-fledged embrace right afterwards. We never see them fall in love, we just see them in love, and it feels tremendously abrupt and wrong for Didon’s character. The entire fourth act is treated like an interlude–but plot-wise, without it the fifth act wouldn’t be much, so this other-worldliness feels off. Musically there was more to be enthusiastic about. Donald Runnicles’s conducting did not have the neurotic tension nor the sheer strangeness of Colin Davis’s, but it had a light energy and forward momentum that kept things going a lot better than the staging did, with an excellent sense for the large-scale pacing of this long score. The offstage groups and otherwise enormous forces were excellently coordinated. He did not emphasize the crashing dissonances or eerie sounds, this was Berlioz that sounded remarkably normal, yet still like Berlioz. The orchestra sounded good but not great, with some scrappy wind sections and slackening towards the end of the evening. 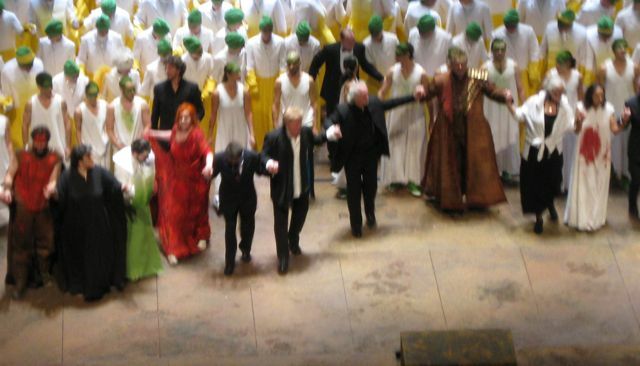 The Deutsche Oper Berlin’s chorus is famously good, and they were one of the best things about this performance, singing with amazing nuance, homogeneity and balance. The chorus music seemed every bit as directed and musical as any other section of the score (more than some of the principals, actually), and that’s a rare thing. They also moved very well, and from my customary back-of-the-house seat looked like a convincing crowd even while singing so well. Petra Lang’s towering Cassandre was by far the best of the leads. Her portrayal has grown since her excellent 2001 recording of the role (get that CD, it’s awesome! ), and her Cassandre has fatal, desperate gravity, sung with an imposingly large voice yet great detail and attention to the text. She knows how to hold back until the biggest moments, she can be gentle as well as ferocious, and while I was sitting too far away to be a great judge of detailed acting, she has charisma, even while wearing someone’s grandmother’s afghan and maniacally knitting part of a hobby horse. The many supporting roles were more satisfyingly filled, with Markus Brück’s thuggish-looking but sweetly lyrical-sounding Chorèbe and Liane Keegan’s big-voiced Anna particular standouts. Ex-NYCO’er Heidi Stober sounded excellent as Ascagne and Gregory Warren was a pure Iopas. Technical values were mostly good except for some mysterious offstage clunks and a few poorly blended follow spots. Was it worth it? Of course, its Les frickin’ Troyens! In case you haven’t noticed, I love this score. But I hope I’ll run into a more rounded production soon. The reception involved lots of cheering for everyone except lots of booing for the production folks. There were also an dismaying number of unsold seats. At a premiere of a major work, Berlin? Really? Is this normal? 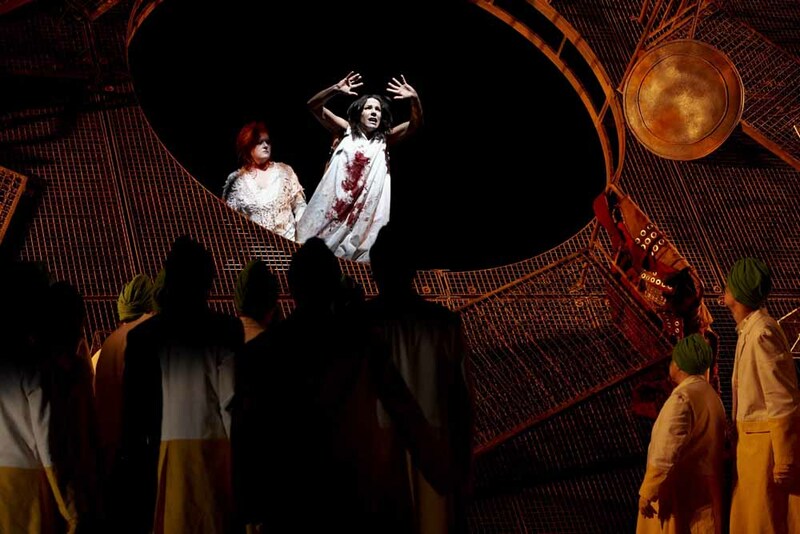 I’m back in Vienna and tired, but will be off to Reimann’s Medea at the Staatsoper tonight anyways! I still owe y’all words on the Royal College of Music’s excellent Orpheus aux enfers, I am working on that! Great to read your review – I too was there. Petra Lang certainly (in my opinion) gave the performance of the evening. It was my first experience of Runnicles and I thought he handled the score admirably. 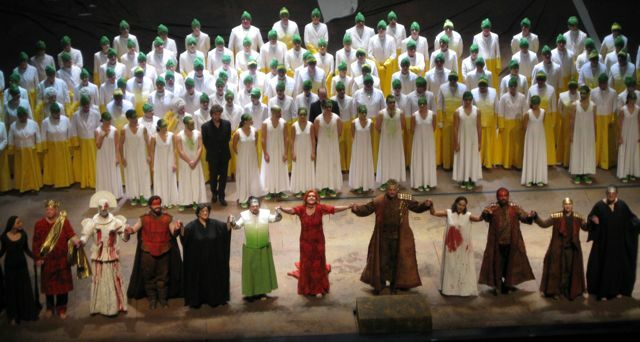 I too was at first unconvinced of Uria Mozon's Dido (and I was sitting in row 8 – towards the front of the house). However, I would probably put it down to nerves. She did notably improve through the evening – started without making much of an impression, but had a much more noble presence with the love duet.. by the final scene, I thought she was doing very well indeed. Last time I heard this was in Paris with Polaski – if I had the choice today, I would probably go with Uria Mozon. I didn't see too many empty seats, but would certainly recommend anyone in Berlin to snap up any remaining tickets.. I reckon the performances will improve more throughout the run. Now, when will Covent Garden do a new production? One has been rumoured; I'm hoping it comes soon, and with Petra Lang please! Interesting. The reception for Uria-Mozon was so positive I was giving her the benefit of the doubt. I agree that she improved over the course of the evening. There were lots and lots of empty seats in the second ring. In Vienna it's usually the cheap seats that sell out first! As for other Didons, I like Michelle DeYoung on the more recent Sir Colin Davis recording. And of course there's Susan Graham. And I can't help but think that Bernarda Fink would be awesome, though really lyric. The rumor I heard of the Covent Garden Troyens named Eva-Marie Westbroek as Cassandre (and McVicar directing and Kaufmann as Énée). This supposedly has something to do with the 2012 Olympics–I think someone at the opera house needs to remember the role the Greeks play in this opera. I guess Elektra would be less festive, though. Many thanks for your review! I wished I could have stayed longer in Berlin last week to hear this. But hopefully it will come to London in 2012, as you heard through the grapevine :-))! Oh yes, I do recall that rumour about Westbroek.. though that's the first I've heard about the tie-up with the Olympics(?!) Kaufmann would make a wonderful Enee. However appropriate, I do hope they bring back Elektra soon – I do love that ROH production. Interesting about empty seats in Berlin. Certainly not many to spare at the stalls level.. though a handful of people did leave after Act2. I realise it's still quite a lot for most, but top price tickets at the Deutsche Oper are actually much lower than houses like ROH.. For a top ticket for Tannhauser at Covent Garden this weekend, you could probably get a return flight to Berlin AND a great seat for Les Troyens. Though I imagine a ticket at the Staatsoper is more eye-watering..
Also, I do agree – the latest Colin Davis recording is fantastic. I remember the CD cast repeating the performance at the BBC Proms (maybe 2003?) – back in my student days I was sitting in the choir seats.. thrilling to be sitting practically alongside the performers. Wonder whether Voigt will reprise Dido.. that would be worth a listen..
Not only is the Deutsche Oper much less expensive than the ROH but the sight lines from the cheaper seats are better than almost anywhere else in Europe. I was far away, but I could see the whole stage perfectly. I know Voigt did Cassandre at the Met but she's sung Dido as well? Ahh.. you're quite right.. she did Cassandre – I never heard her at the Met, but have the recording with Dutoit (not as good as the Davis recording). But I wonder if she'll add Dido to her repertoire (rather than reprise). I've not heard her on the stage since her weight-loss – only at concert recitals. She must be concentrating on Brunnhilde right now..
Agree with the Deutsche Oper.. I walked around during the intervals and did notice the fantastic sight lines. I guess that's the benefit of having a relatively modern theatre. Lucky Berlin! Went to Tannhauser at ROH – Botha did well, though I thought he seemed less comfortable in the last act (he was tiring perhaps?) Westbroek was fantastic, as was Gerhaher. Wasn't so sure about Bychkov's broad tempi at first, but it completely worked.. another great night of Wagner from him. I also did like the new production – nothing to shout about too much, but interesting, uncluttered and allowed focused on the music, which is definitely the best thing of the evening. Really hope they revive this next season.. after all, if you can bring back that awful Aida (production and singer), surely this should also make a return!